I am a Mineral Surveyor and have been one for some time. The BLM retained me to teach BLM surveyors at the National training center in Phoenix the methods of dependent resurveys of Lode mining claims. I put the plat together as a demo for my talks and lectures on how to follow the notes. It also served as a lead in to why TPC is perfectly suited for surveyors of all types. The NTS training sessions were designed to explain how the original MS surveys were executed in reality to aid the BLM surveyors in their dependent resurveys. Most of the dependent surveys here in our county were done poorly with reference to compass rule relocation as opposed to the grant boundary method. I worked for a Mineral Surveyor while at the University of Arizona. I received my appointment in the early 1980’s. 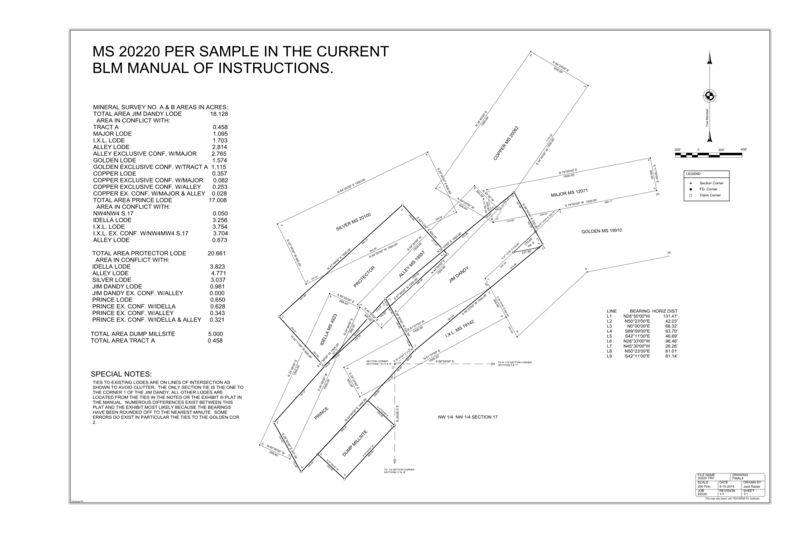 I have several approved MS surveys and my practice constituted retracement and dependent surveys of the existing surveys in Mohave County. I have lectured during many professional gatherings on the ways and means of mining law and mineral surveys. The plat I sent was meant to be viewed by the BLM folks together with a dissertation. Viewing was not possible but they each had their Manual and the exhibit was referenced instead.